what up peeps?? im taking a break out of my insanely busy week to let you people know about the current job. First Baptist New Braunfels is doing a total renovation worth $6.5 million on their A-frame sanctuary probably built in the 1950’s. and this is the biggest install i’ve been apart of thus far, and more importantly this is the most technological of them all. the church has notoriously had dirty power issues, so not only do they drop a new pole for power, but we also do our part and install a Lightviper fiber-optic snake. this fiber snake carries about 32 channels and 8 returns fiber-optically. eliminating any and all ground noise from power and any other kind of interference. basically lightening could strike the actual cable and nothing would happen to it. the fiber snake actually connects to a card that plugs in the back of the digital console. no 48 analog mic lines. just 1 fiber cable. 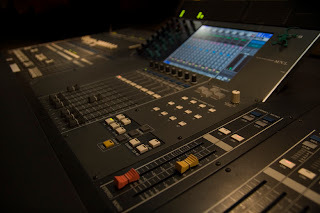 another card plugs in the back of the console that is for their aviom monitoring system, which allows 16 channels or subgroups routed by way of cat 5 from the console to different mixing pods around the stage, thus giving the performer control of their own mix. today, my bosses son chris, who mixes monitors for country singer miranda lambert, he had a few days off so he came in to do some training on the console for the church’s audio guys and i. i had already been asked to learn the console and be the company rep at their first 2 services, and of course i said yes because i want them to use it right, and i wanna know it myself! i can’t help but imagine the service starting and no sound is coming out, and im looked at with a clueless look on my face!